Buying in bulk reduces the per serving cost of your groceries. This fact became painfully clear on my last trip to the supermarket. I intended on purchasing a 5-pound bag of Russet potatoes. For 2 people, that’s a convenient sized package that will ensure we will likely finish the bag before any spoilage sets in. 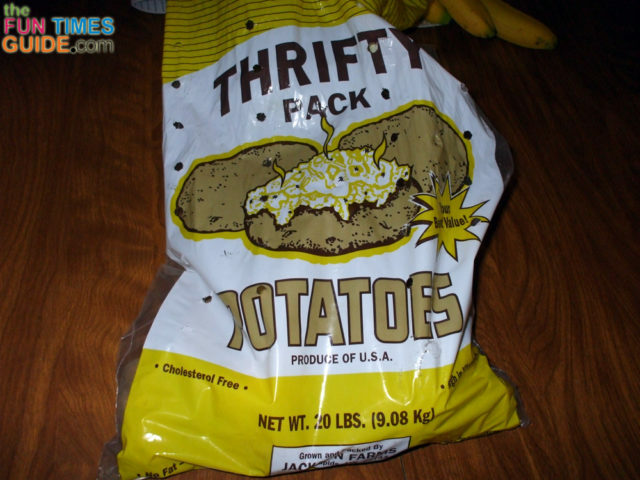 But I was a little taken aback when I discovered that the cheapest 5-pound bag of potatoes was priced at $3.89! It seems just 6 months ago I was paying about $2 a bag, and this time last year it was closer to $1.50 for a sack of potatoes. I shook my head and was about to bypass the potatoes altogether when I noticed across the aisle they had 20-pound bags of potatoes priced at $4.39. For a mere 50 cents more, I could buy 4 times the number of potatoes! And, better yet, looking through the clear plastic bag I could see there were some lovely large baking quality potatoes in the bag too. I loaded up the bag and spent the rest of the trip wondering how I was going to get through this huge quantity of spuds without wasting half the bag. Here’s a helpful chart for identifying varieties of potatoes, along with tips for preparing them. Memories of my youth in a family of 7 quickly came to mind. We commonly bought potatoes in 100-pound bags and stored them in a dark cool corner of the basement. I don’t remember any disposal issues from those days, so I chose a closet in an unused room in which the thermostat is kept very low as the storage locker for our 20-lb bag of potatoes. Our first meal using these potatoes confirmed my decision to buy such a large bag. 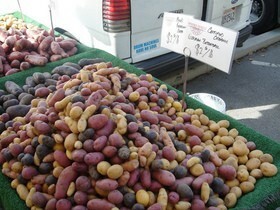 The quality of these larger potatoes was much better, almost creamy in their own right. I began to think that maybe they only put second-rate potatoes in 5-lb bags, because they’re generally smaller and I’m accustomed to finding a lot of bruises and cuts when I go to use them. Throughout the next few weeks, I tried some new recipes along with some of my old standards. Following are a few good recipes that will help you work your way through a larger than normal supply of potatoes — without it seeming like you’re eating the same thing day after day! Breakfast Potatoes – Everyone’s Favorite! Frugal shopping may give you more of one thing than you’re used to. That’s alright, because most items can be made into many different meals. It was fun to find a creative way to cook some different meals that I probably wouldn’t have considered if not for an over-abundance of potatoes. Hopefully, this sampler of ideas for using potatoes shows that no matter what meal you’re preparing, there is a way to include potatoes and make it unique!